At the turn of the last century the real estate firm William Hall’s Sons focused on erecting high-end homes in the city’s most fashionable neighborhoods. In 1901 construction began on two five-story mansions at Nos. 5 and 7 East 75th Street, steps, just steps from Fifth Avenue and Central Park. The developers had commissioned the architectural firm of Welch, Smith & Provot to design the houses. Completed a year later the houses gracefully complimented one another; each mimicking the general design of its neighbor, yet flexing their own architectural identities. Like its sister, No. 7 was a French Beaux Arts town house worthy of Paris. Clad in limestone it featured two stone balconies with heavy carved balustrades and oversized, stylized acorn finials. The steep, copper mansard was punctured by elegant dormers with arched, carved pediments. Inside were 26 rooms and ten baths. Two years after construction was completed, the house was purchased by James McLean. How long McLean, who was Vice President of Phelps, Dodge & Co., lived in the house is unclear; but in 1915 he was leasing it to Stephen Guion Williams. Williams was a lawyer and partner in the Williams and Guion Black Star Line. He had the distinction of having earned the first Ph.D. from Columbia University in political science in 1883. 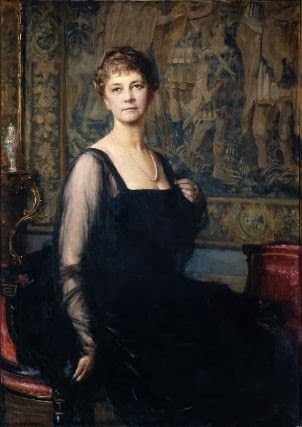 Also in the house were Williams’ wife, the former Charlotte Grosvenor Wyeth, and her four daughters from a previous marriage. Following Frances Hawthorne Wyeth’s wedding to E. Kenneth Hadden in the nearby St. James’s Church on Madison Avenue and 71st Street (which was filled with “a large and fashionable assemblage,” according to newspapers), a reception was held in the mansion. The New York Times reported that the newlyweds received in the drawing room “against a background of white lilies and roses and under a canopy of white and yellow Spring flowers.” It mentioned, too, that following their honeymoon of “several weeks” in the South, the couple would be living just a block away, at No. 7 East 76th Street. In December 1916 James McLean announced that “negotiations are pending” for the sale of the house and told reporters that the unnamed buyer intended it to be a Christmas present. At the time the building was assessed at $170,000—about $2.5 million today. Before long the name of the person giving the extravagant Christmas gift became known. The wealthy Dr. James Henry Lancashire and his family had been living at No. 1015 Fifth Avenue. Daughter Helen had recently married Umberto M. Coletti, the Managing Director of the Italian Immigration Society and moved to Rome. The couple’s only son, Ammi Wright Lancashire was in Europe at the time, accompanying war correspondence E. Alexander Powell on a tour of England and France; leaving only the Lancashire’s youngest daughter, Lila, in their new house with them. The 29-year old Ammi had studied at the prestigious Phillips Academy in Andover, and then graduated from the Sheffield Scientific School in 1911. Now, already in Europe, he was commissioned as Ensign on July 5, 1917, the day before the United States entered the conflict. The Navy sent the privileged young man back to New York, assigned to desk duty in the Cable Censor Department. 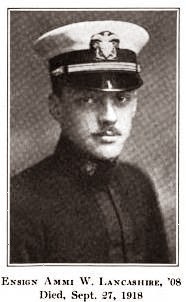 Later Claude Moore Fuess, writing in “Phillips Academy, Andover, in the Great War,” said “Desk work, however, was not what he desired; in the spring of 1918 he applied for sea duty, and was transferred to the U.S.S. ‘Kansas.’” Ammi Lancaster left his parents’ home on East 75th Street, never to return. 1918 was a dark year; not only because of the war, but because of the Spanish influenza pandemic that was taking hold. Within a year more people would die from the flu than in the war—a death toll estimated at between 20 and 40 million people. In that single year more people died of influenza than had succumbed in the four-year period of the Black Death Bubonic Plague during the Middle Ages. While Lancashire’s ship was still in the Philadelphia Navy Yard, he contracted influenza. His condition worsened into pneumonia. He died on September 27, 1918 in the Philadelphia Naval Hospital. Even after that anniversary the League was going strong. On the evening of February 26, 1922 at 8:30 Sara hosted “an authors’ reading by members of the Dante League of America.” That summer daughter Helen and her husband spent the summer in Manchester with her parents; then the two couples sailed on the Majestic to Italy in October. 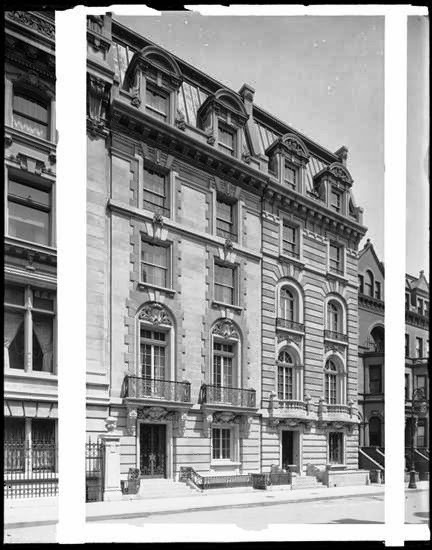 By 1933 the Lancashires were leasing the 75th Street mansion to Frederick N. Watriss. Society’s focus was not so much on Watriss and his wife, the former Brenda Frazier, but on his step-daughter Brenda Diana Duff Frazier, known most often as Diana. Diana’s parents had divorced. Her father, Frank Duff Frazier, died on June 21, 1923 and his will directed that she was “not to receive more than $1,800 while under her mother’s care and influence,” as reported in The New York Times. By the time Diana reached 14 years of age, however, her necessary expenses were higher than that amount—at least by her mother’s estimations. So in 1934 Brenda Watriss went to court to plead for additional funds from Frazier’s estate. “In her petition to the court Mrs. Watriss said Brenda was being brought up in the style of living adopted by her father during his life time, that he had maintained homes at Palm Beach and other places and that his living expenses amounted to $150,000,” reported The Times. “Mrs. Watriss said the child had an income of more than $100,000 a year from the estate of her father and her paternal grandmother, Clara Duff Frazier. Also included in the tally of items the girl was expected to pay for were “Servants, including chauffeurs and extra help for parties, $10,180; maintenance of automobiles, $4,500; interest on mortgage, $6,600; taxes, $5,000; insurance, $500; gas and electricity $700” and a nearly-endless list that included elevator inspection. In the end Surrogate James A. Foley granted her mother, as guardian, $30,000 a year for the Diana’s “maintenance and support.” The sum would amount to about half a million dollars today. In 1938 Brenda introduced her daughter to society in a debutante party in the Ritz-Carlton Hotel with more than 1,000 guests attending. The astonishingly-beautiful girl was a favorite of society and the press alike. When she appeared at a social function wearing a strapless evening gown, the reaction was not shock but emulation. She sparked a new fashion trend that swept the nation. The Lancashires owned the mansion until 1938. On October 1, 1940 The New York Times reported that “A client of the Apartment Renting Company, Inc.” had leased the house from the Bank for Savings. Before long the grand home would be converted to apartments. In 1945 the Department of Buildings noted that there were four apartments each on most floors. Despite the conversion the mansion is little changed on the outside--an elegant page from a polite period of debutante balls and dinner parties. Is this the home used for exterior shots of the television program, "The Nanny"? I had to double check that for you, but yes, that's the house used for the exterior of the Nanny mansion. Good eye!